Dr. James Waako demonstrates how health workers log in using the biometric scanner at Iganga Hospital, where absenteeism is now 10%—down from 50% a year ago. Photo by Tommy Trenchard for IntraHealth International. A 2015 study revealed that 50% of health workers in Uganda’s public sector weren’t showing up, or came to work but left early to collect dual pay at another facility. Today, that number is down to 11.9%, thanks to a new monitoring system that helps health officials track and analyze attendance data and take appropriate actions against chronically absent staff. Health worker absenteeism undermines staff morale and the quality of care patients receive. It wastes health sector resources, unduly burdens staff with additional workloads, and compromises communities’ use of health services. On this particular day, she was monitoring five mothers and their newborns—plus a group of six midwifery students completing their practicums under her supervision. Tracking attendance is the first step to ensuring health workers are there to deliver critical services and that staff workloads are equitable and safe. Unapproved absences fell dramatically—by 62%—and have remained low ever since. To address the absenteeism afflicting Uganda’s already stressed and understaffed health sector, a team of IT and performance management experts on the IntraHealth International-led Strengthening Human Resources for Health (SHRH) activity piloted a package of attendance-tracking tools in 27 priority districts in January 2016. They saw immediate results. Unapproved absences fell dramatically—by 62%—in just a few months and have remained low ever since. The team then rolled out the approach to 4,507 facilities in 116 districts this year, and the results are consistent: far more providers are present for work. The backbone of the tracking system is the unified human resources information system iHRIS, used throughout Uganda to help ministries, health professional councils, and districts collect the data they need to make crucial decisions about health workforce funding, deployment, and development priorities. Here’s how it works: Every health worker in the public sector has an HRIS (or human resources information system) record. Facilities track attendance on a daily basis and submit monthly reports to the central HRIS database, which updates individual health worker records. Most health centers manually record attendance, but seven high-volume sites—mostly hospitals that employ hundreds of health workers—are using biometric scanners to log employees in and out. Once the monthly data are in, payroll managers in each district run attendance reports and immediately see who reported to work fewer than the standard number of required days per month (usually 20). They check with facility heads to see if there are extenuating circumstances, before recommending sanctions to the district health officer and chief administrative officer, who oversee public health facilities and funds. Sanctions include paying prorated salaries based on the number of days absent, disciplining chronically absent staff, and removing ghost workers—individuals on the payroll who never report to duty—from district payrolls. SHRH rolled out the approach to 4,507 facilities in 116 districts this year. 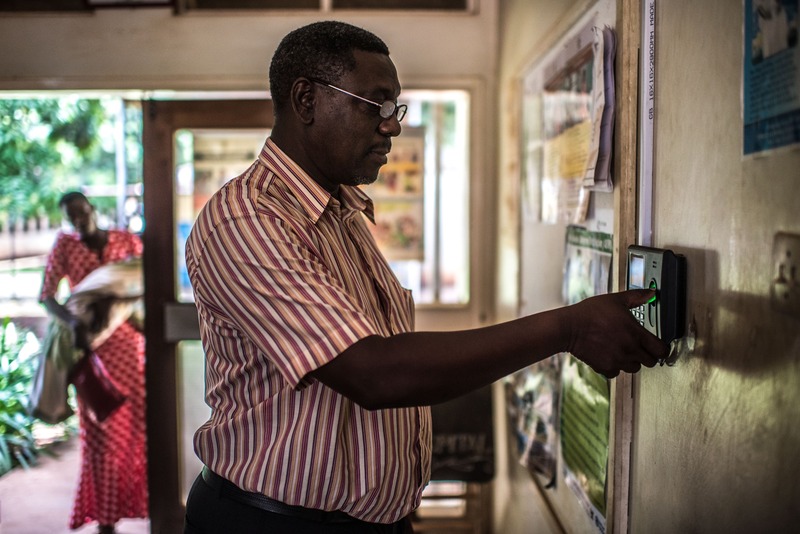 In the next quarter, the SHRH team is gearing up to install biometric machines and implement smartphone tracking in 20 districts in eastern Uganda and 255 more facilities nationwide. Chronic absenteeism has many underlying causes. The most common reasons are sickness, housing, and transportation issues. But there are myriad other systems-related causes, including weak supervision, a lack of clear job expectations, delays in getting paid, and poor working conditions. Tracking attendance is just one intervention in a comprehensive package of performance management and retention strategies that SHRH has rolled out nationally to address these systemic problems, and promote greater transparency and accountability in the health sector. The USAID-funded Strengthening Human Resources for Health in Uganda Activity works to improve health care and health outcomes nationally by addressing performance and management problems, low retention, and skills gaps affecting the health workforce. In addition to her primary role caring for patients, Babirye supervises midwifery students completing their practicums at the hospital. Photos by Tommy Trenchard.